The Inland Waterway is Michigan's longest chain of rivers and lakes. The town of Indian River is right at the heart of it! The Inland Waterway, which is more than 35 miles long, runs through Pickerel Lake, Crooked Lake, The Crooked River, Burt Lake, The Indian River, Mullett Lake, The Cheboygan River, and finally into Lake Huron. •Can handle boats up to 65 feet long (18 foot beam) with up to a 5 foot draft. •The Route has two bridges along the way that do not open. Lincoln Avenue bridge has a vertical clearance of 20 feet and M-33 Highway bridge has a vertical clearance of 16.7 feet. •The Route is 38.2 miles long. •The Route features two locks. 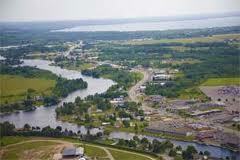 Cheboygan River Lock - call the Michigan DNR Field Office in Cheboygan at (231) 627-9011 for fees and time schedules. Crooked River Lock - call the Michigan DNR Field Office in Petoskey at (231) 347-2311 for fees and time schedules. •Longest distance between gas stops is 10 miles. •At the waterway’s north end, you’re just 15 miles from Mackinac Island, 18 miles to the Mackinaw Bridge, 21 miles to the Les Cheneaux Islands, 60 miles to the North Channel, and 80 miles to the Soo Locks. •Navigation on the Crooked River generally limits boats to 25 feet. •17 species of fish inhabit the waterway. The glaciers of the last Ice Age retreated to the north some 25,000 years ago, leaving behind the lakes that rank as Michigan's most notable and geographical feature. Among the state's largest inland lakes is Burt Lake, named after William A. Burt, who, together with John Mullett, made a federal survey of the area from 1840 to 1843. 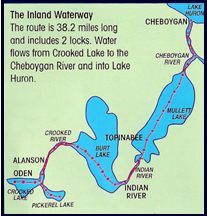 By following the Cheboygan River, Mullett Lake, and Indian River to Burt Lake, then up Crooked River to Crooked Lake, Indians and fur traders had only a short portage to Little Traverse Bay. Thus they avoided the trip through the Straits. Completion of a lock on the Cheboygan in 1869 opened this inland waterway to the Cheboygan Slack Water Navigation Company, whose vessels carried passengers and freight until railroads put it out of business. Day-long excursions over these waters became popular with tourists.